Promera Sports Pump Extrem Review – Should you buy it? Nitric oxide boosters have come a long way, from being a novelty supplement, to a bodybuilding necessity. Due to the latest research involving muscle strength and recovery, nitric oxide boosters are no longer taken for the pump, but also for the added strength and recovery it provides. Choosing the right nitric oxide booster could be a disaster if you don’t know what qualities to look for. One of the most popular nitric oxide boosters today is Pump Extrem by Promera Sports. It’s said to have an advanced nitric oxide booster component that will produce intense muscle pumps, increased focus, and enhanced energy levels that will help users achieve better workout performance. We have already reviewed an awesome nitric oxide booster in NitroGenix 365, and we’ll try to pit these two nitric oxide powerhouses to see which muscle building supplement rises on top. Nitric oxide is a vasodilator – a compound that dilates blood vessels to allow more blood to pass. Bodybuilders and athletes take nitric oxide boosters to achieve that unique pump, or the sensation that you have tight, massive muscles after working out. That same pump is caused by increased nitric oxide in your body, which also supplies your muscles with the nutrients and energy it needs to increase strength and recovery. Who uses Promera Sports Pump Extrem? Nitric oxide boosters like Pump Extrem are taken by serious athletes and bodybuilders who want to improve their workout performance and lessen their recovery time. Increased strength during workouts raises the workout ceiling for bodybuilders and athletes, and decreased recovery time allows them to increase the frequency of their workouts. Most people mistake nitric oxide boosters as muscle-building supplements, but it does no such thing. Nitric boosters do not work in the same capacity as proteins, which literally build your muscles. Nitric oxide boosters help by increasing your workout endurance, improving your workout performance, and speeding up your workout recovery. These ingredients suggest that Pump Extrem is a cross of your traditional pre-workout supplement, and your usual nitric oxide booster. It’s important to note the formula contains 200mg of caffeine, which may cause side effects especially if you are already taking pre-workout supplements or fat burning supplements. While there are some vasodilators in the complex, it would have been better if L-Arginine and Yohimbe were included to reinforce the formula. These two vasodilators are considered the best vasodilators in nitric oxide supplements, and are used by the best muscle building supplements like NitroGenix 365. Nitric oxide boosters are not meant to be taken as pre-workout supplements – simply because they cannot be absorbed by your body fast enough for it to have some actual effects. Nitric oxide boosters are better if taken as a daily supplement like NitroGenix 365 because nutrient delivery for muscle recovery needs to be consistent. 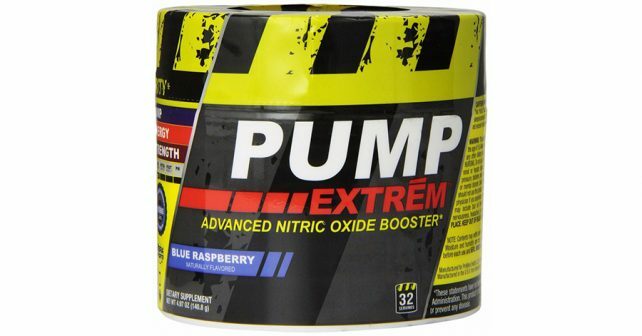 It would make sense to buy Pump Extrem if you’re trying to save on buying your pre-workout and nitric oxide booster separately, but at $1 per serving, you’re better off buying those separately.